My stars, oysters are a wonderful invention. Not only are the bivalves deliciously sweet and sea-breezy, they're also the ocean's kidneys. Oysters filter seawater's excess nutrients, and the waterways where they're farmed are among Australia's most pristine. Oysters don't just thrive in clean water, they help create it and supporting sustainable oyster production is key to bioremediation and healthy marine ecosystems. All power, then, to Lee Potter Cavanagh (ex Victoria Room) for serving oysters at his very vegetable-focused new all-day bar and restaurant in Bondi. "We're not about being plant-based, pescatarian or vegetarian," says the award-winning bartender. "We're more about sustainability and serving food we love to eat." 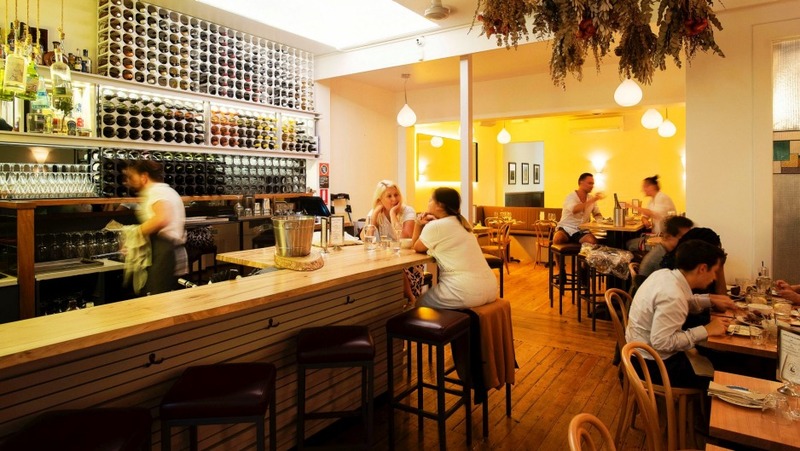 The bloke has done a bang-up job renovating the joint with family and friends to create a welcoming space of blond wood, warm colours and choose-your-own-adventure seating – tall tables outside for a first-date rosé ($13.50 a glass for the Yarra's easy-drinking Dominique Portet 2018); a long banquette indoors for lazy weekend brunches. 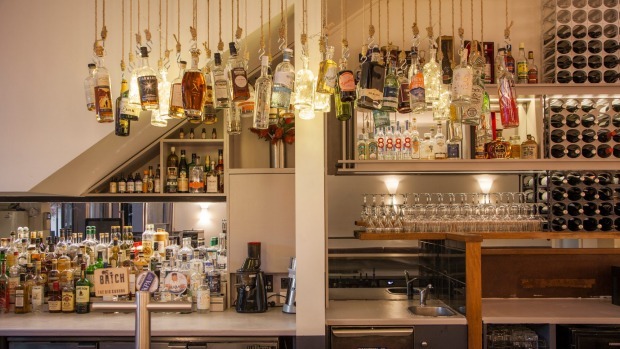 Wild flowers and local spirit bottles hang from the ceiling. Potter Cavanagh and Toby Marshall (ex Charlie Parker's) put those spirits to fine use in a cocktail list lush with Australian flora and a small amount of fauna. River mint freshens a tarty spritz of gin, vermouth and citrus ($16) while PS Soda wattle cola bolsters Maidenii sweet vermouth and Adelaide Hills orange amaro ($17). 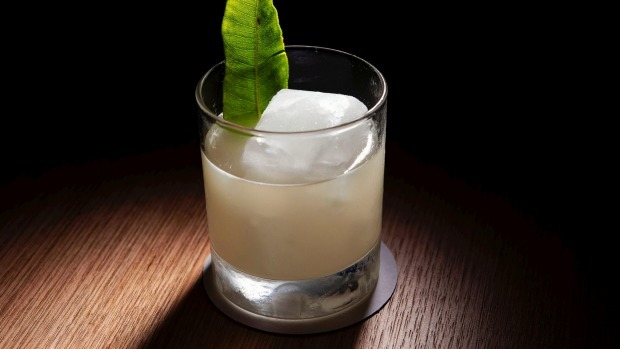 "We call it the Australiano," says Potter Cavanagh and if the restorative highball was the only thing I could drink for the rest of summer, I would be OK with that. Meanwhile, Adelaide Hills green ant gin featuring real-life (albeit long dead) green ants is used in a frothy banana fizz with honey ($22) that's a nifty idea after dinner. All beers are brewed in Sydney (check the super refreshing Nomad gose for $10 a tin) and local coffee legends Edition roast Brazilian beans for a morning flat white ($4). Anyway, back to those oysters. At the time of writing they're from Tuross Lake on the south coast and served with fermented onion mignonette at $4 a pop. Oysters are the only animal on the menu with the exception of an optional market fish add-on with zucchini noodles, lemon myrtle and cherry tomatoes ($18). Leek terrine ($16) is a textured, pretty thing held together by cashew butter and served with grilled Iggy's sourdough for slathering. A healthy lunch or light dinner, particularly with a cute plate of curried lentil falafels ($14) sharpened with apple kimchi. 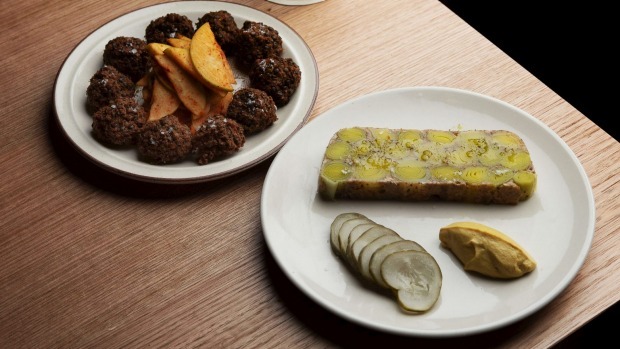 Iggy's bread also rides shotgun with a bowl of happy peaches and creamy Marrickville stracciatella ($18) that makes a very good case for why plant-based "cheese" will never beat the real thing. Potter Cavanagh tells me kangaroo was recently on the carte because it's one of the most sustainable and environmentally sound forms of meat around. There's a lot a roos in Australia and we should be eating more of them. There's been a lot of kerfuffle recently regarding plant-based burgers that "bleed", and millions of dollars invested in a fake meat industry that advocates say is the future of protein consumption. I think what Rosenbaum & Fuller is doing is a smarter and certainly way more delicious example of how we should be eating to save the world from ourselves. Beautiful vegetables, a few oysters, hopefully some venison tartare. American author Michael Pollan once said that everything he learned about food and health in his career can be summed up in seven words. "Eat food, not too much, mainly plants." I reckon he would like Potter Cavanagh's menu philosophy a lot. I know I certainly do. If you only drink one thing: The Australiano, $17. If you only eat one thing: leek terrine, $16.